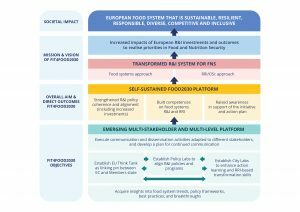 FIT4FOOD2030 supports the urgently needed transformation of research and innovation (R&I) on Food and Nutrition Security (FNS) in Europe. This transformation is needed to future-proof the European food systems: to make them more sustainable and resilient, and to find solutions for the many food-related challenges Europe is facing, including hunger, malnutrition, obesity, climate change, scarce resources, and waste. 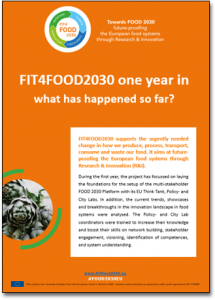 To achieve that, FIT4FOOD2030 will create a sustainable, multi-stakeholder platform, mobilising a wide variety of stakeholders at the level of cities, regions, countries, and Europe. Recognising the evolving nature of the FOOD 2030 policy framework, the project activities will be flexible, responsive, inclusive, efficient, innovative, value-adding and supportive to the FOOD 2030 policy framework of the European Commission Directorate General for Research & Innovation (DG RTD). Background information on why the current Research and Innovation system on FNS is inadequate. 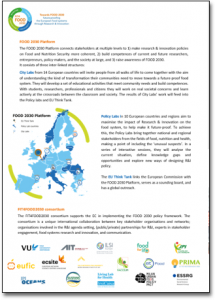 FIT4FOOD2030 is a ‘Coordination and Support Action’ funded by the European Union’s Horizon 2020 research and innovation programme. The project started on 1 November 2017 and lasts three years.